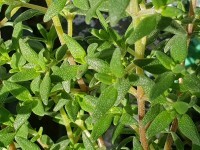 Thymus fragrantissimus - This thyme is ideal added to a bouquet garni. Use to flavour hardy meals, bone warming soups, and piquant sauces. Excellent with fish, poultry, veal, roasted vegetables, stews and soups or in marmalades and chutneys. Height 30cm. Cultivation methods: They are fully to marginally frost hardy, You should plant them out from early autumn through to early spring in a sunny site with moist, well-drained soil. You can propagate from cuttings in the summer or by division. Needs to be in the shelter.